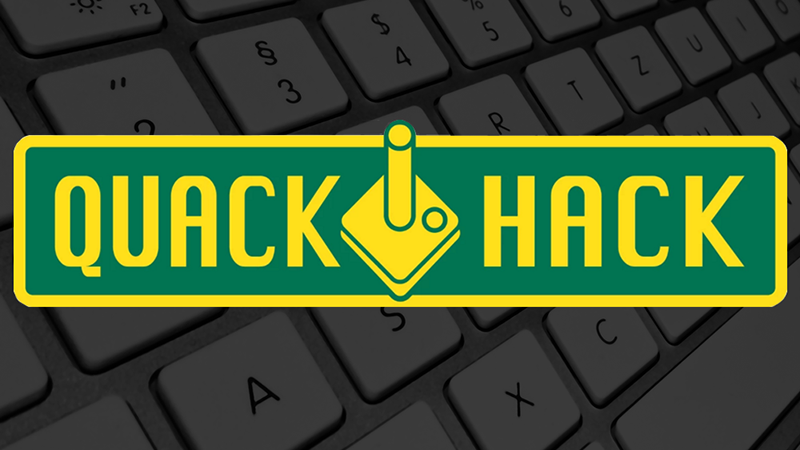 Product innovation around the growing $15 billion gaming industry is the focus of the University of Oregon’s first intercollegiate hackathon, dubbed QuackHack. The event takes place Jan. 15-17 at the UO’s Lundquist College of Business. College students from any university in Oregon, the Northwest and beyond can register to participate in the free event. QuackHack is a 40-hour prototyping event expected to draw more than 200 college students and business leaders from across the United States and Canada. A "hackathon" — short for hack marathon — is a term from software development used to describe events in which people collaborate on a focused topic for an intense period of time to create useable product prototypes. QuackHack expands the concept of a hackathon beyond software development to encompass students from all majors and disciplines. At the UO QuackHack, student teams will develop prototypes broadly around the theme of gaming, which can include ideas and concepts beyond software development and programming — including video games (from education technology to e-sports), mobile apps, Internet-of-things, board games and recreational games. In addition to the student prototyping hackathon, community members are invited to participate in several events throughout the weekend, including tech talks and a video gaming tournament that will run concurrently with the event. "There is a long history of video game development in Eugene and the greater Willamette Valley", said Joe Maruschak, founder of game company BraveTree, which was acquired by the well-known Eugene-based GarageGames. Maruschak is now chief startup officer for Eugene RAIN, the local chapter of a state-backed consortium of entrepreneurs, educators, local governments and businesses seeking to grow startups in Oregon’s southern Willamette Valley. This is the inaugural year for QuackHack, the first collegiate-sanctioned hackathon focused on gaming in the United States and Canada. Organized by Lundquist Center for Entrepreneurship, the UO computer science student group HackTownUSA and the collegiate hackathon organization Major League Hacking, the weekend activities will be hosted in the UO’s Lillis Business Complex. The free event is open to all college students, who can register to attend as a team or as an individual and be matched to a team. Participants will be working, eating and residing in Lillis Business Complex for the weekend. Students can attend with an idea for a prototype but cannot have started the concept. Student teams will be competing for more than $3,000 in cash prizes for the winning projects. The registration deadline for QuackHack is Monday, Jan. 11. “With over 100-plus talented students from across 40 universities already signed up to attend from such prestigious institutions as Stanford, the University of Pennsylvania, UCLA, Georgia Tech and the University of Waterloo, we are psyched to see what types of gaming prototypes will be developed by the students, the possible commercial applications of those inventions, and the general networking and business development opportunities available with the technology leaders in attendance,” said Kate Harmon, undergraduate program manager of the Lundquist Center for Entrepreneurship.